Cedars-Sinai investigators have developed a new, more accurate set of guidelines for assessing the severity of head and neck cancers and predicting patient survival. The new guidelines, outlined in a study recently published in the Journal of Clinical Oncology, center around counting the number of malignant lymph nodes found in each patient. For decades, doctors have determined the stage and predicted the progression of head and neck cancers based primarily on nodal size, location and how far cancer has spread beyond the lymph nodes, but they have given less importance to the number of cancerous nodes. As a result, staging and treatment recommendations, based on current national guidelines, “are the same whether a patient has two or 20 positive lymph nodes,” said Zachary S. Zumsteg, MD, assistant professor of Radiation Oncology at Cedars-Sinai and the study’s senior author. The Cedars-Sinai study involved reviewing data of 14,554 U.S. patients identified in the National Cancer Database who were treated for squamous cell carcinoma of the oral cavity (mouth, gum and tongue) between 2004 and 2013. The data showed that an increased risk of death was associated with each additional cancerous lymph node found. The investigators concluded that the number of cancerous lymph nodes is a predominant, independent factor associated with death in those patients. The study also identified an ultra-high-risk group of patients with five or more cancerous lymph nodes. 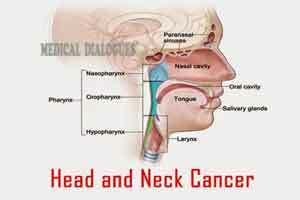 Head and neck cancers occur in the lips, tongue, gums, bottom of the mouth, throat, larynx, nasal cavity and salivary glands. About 63,000 people developed head and neck cancers in the U.S. in 2017. More than 13,000 deaths from those cancers occurred during that period, according to the American Society of Clinical Oncology. “Although considering the number of cancerous lymph nodes in staging is a simple concept that many head and neck cancer specialists have assumed to be true for years, data has been limited until now,” Zumsteg said. The study authors said they hope that, based on the new data, the number of positive nodes in staging will now be incorporated into clinical practice.